Why use Grafton, OH Property Management company? Why use a Grafton, OH Property Management professional property manager? Consider the following. You can feel secure as you use our Grafton professional services which work as a system to protect you while maximizing your return on your property investment. Owner clients have reduced risk with our leasing and tenant guarantees as well as our easy out agreement. Save money and get your house leased fast with our professional videos, pictures and descriptions being exposed on 100s of websites and way more. Realty Trust Services 7 point screening process gives owners the best possible chance of getting a great paying resident. Rely on our experience to most efficiently prepare your house for rent and select an ideal rental rate. Property owners can rest easy, and get an uninterrupted night’s sleep, knowing our 24 x 7 take that midnight call and dispatch help as necessary. Be in the know and head off potential problems before with exhaustive property walk through video reports. We handle all bothersome collection and emotionally draining collections calls so focus on the parts of your life you actually enjoy. No stress this year when you prepare your taxes because all of the reports will be neatly delivered with your 1099. You have the option to rent, lease option and / or sell your home, simultaneously, if you desire. We have not yet transferred Grafton specific city research to this site. If you desire this information, please request it at the form above and we will do that. Notes: It is up to the landlord and tenant respecting whom the utility’s name will be under. Grafton Utilities provides water, electric, sewage, and trash pick up. All utilities will be due by the 25th of each month and all of the utilities will be billed together. Landlords are able to check the utility bills for their properties using a reference code. They must call the utility department to get this code. The Village also contracts to have curbside rubbish and recycling pick-up. Fee for these services are billed to the consumer on a monthly basis and are due by the 25th each month. Late Fees may be assessed. The Village of Grafton provides water, sewer, and electric services to residents and businesses. Utility bills can be paid either by mail or in person at Grafton Town Hall, 960 Main Street. Town Hall hours are 8:00 to 4:30 P.M. Monday through Friday. Utility bills can also be placed in an after hours drop box located at the front west corner of Town Hall. Grafton is a small village in Lorain County in Ohio. It is located along the East Branch of the Black River. As of 2012 the estimated population is 5,931. 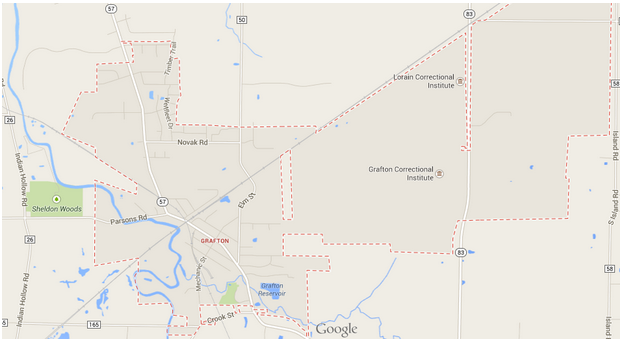 Many prisons are located in Grafton, as well as, The Lorain Correctional Institution. Due to a high rate of prisons, not too many people choose to reside there. Grafton has a total land mass of 4.71 square miles and a water mass 0.03 square miles. Its area code is 440 and zip code is 44044. Grafton time zone is Eastern.